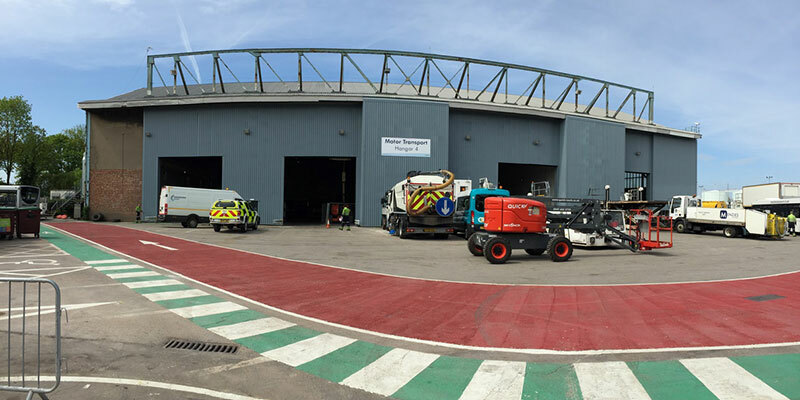 MC Construction has completed a £450,000 upgrade to a 48,000 sq ft hangar at Manchester Airport which is used to service vehicles used on the airfield, such as passenger buses, aircraft tugs and baggage trucks. The 15-week project was the company’s first under a new Manchester Airport building services framework. MC Construction undertook below-ground preparatory works before refurbishing the entrance to Hangar 4 in the Western Maintenance Area with a new steel frame, insulated cladding and automated roller shutter doors. The company also created a new pedestrian walkway in the hangar. Much of the work went on out-of-hours to avoid disrupting day-to-day operations at the hangar. The building is used by Manchester Airport’s Motor Transport division for airfield vehicle maintenance. Around 30 staff work there. Jacobs was the principle design and structural engineer for the project. “This was our first project under this exciting new framework and we are delighted to have assisted Manchester Airport in ensuring the creation of a modern façade for this hangar, without disrupting the day-to-day operations. The three-year framework covers airside and landside building works as well as fit-outs to retail, office and commercial properties. “The project was complicated given the live working environment, but our key project milestones were met and it was a pleasure working with MC Construction on the programme. “We look forward to working with the team again in the future.